Laura Miller of Miller Clear Architects showed sketches of alternative views - of the tree-line or of the new garden room - in a historic house near Coniston. The Lake District National Park: it’s a setting of rare beauty, the birthplace of what landscape means to the modern world. With such a weight of cultural history, it is not surprising that the design of many buildings have fallen victim to pastiche and timidity. How do we achieve great modern design in the context of such awesome heritage? For the last few years, to help promote the Lancaster and Westmorland Society of Architects (LAWSA), I have been working with the Lake District National Park Planning Authority to find solutions to this. Architects and planners working together – who’d have thought it? But it has been a revelation to realise that we share so many aims and can understand each other’s imperatives. As architects, it benefits us if more people understand what we do and how we design. And for planners, better public knowledge and awareness of good design makes a huge difference to the performance of local committees, planning applications and the planning process as a whole. My involvement with the park authority began in 2011 when as editor of A, the RIBA North West magazine of architecture and the built environment, I interviewed Steve Ratcliffe, director of sustainable development at the authority, for a study of design in the national park. Steve is an inspirational leader who believes the National Park should be open to excellent new architecture. He explains: ‘We don’t want design guidelines for the park. We want freedom of thinking. We want design intelligence.’ To further these aims he later asked me to help organise a programme of visits to buildings and lectures by eminent architects, all open to the public. The programme was a great success, with lectures well-attended, but I couldn’t help thinking there must be a way to promote our own local LAWSA architects to the public. After all, these are the architects who have real practical experience of local conditions, local materials, local craftsmen and builders. Local materials and sustainable principles were integrated in the design of Brigsteer Village Hall near Kendal by Ben Cunliffe Architects. As RIBA branch societies go, LAWSA is a bit of a minnow; about 40 practices, mostly small with the largest four employing only 10-16 architects, while our members are spread over a large area from the urban centres of Lancaster, Kendal, Ulverston, Barrow, Windermere and Ambleside to the Lake District and the spectacular surrounds of Morecambe Bay. Few of our practices had had much exposure and examples of good design rarely reached the public; these were not minor considerations and we needed to face them. Three years ago, to raise the profile of LAWSA architects, we set up an exhibition of members’ work called ‘Building in the Country’. Designed as a permanent, travelling exhibition, it is based not on awards but on excellence, with a series of A1 display boards showing photographs, descriptions and plans of some of our best local work. We were all astonished when it opened – so many interesting and intelligent buildings, until then hidden away in the country and hardly ever seen! We now have more than 30 boards on portable (architect-designed) oak stands and can change or add to the exhibition as we wish. It has been on display in Kendal, Lancaster, Ambleside and Keswick and the Westmorland Show (20,000 visitors a day). The exhibition gave a real insight into what LAWSA members do and the quality of their expertise. So last year when discussing a new programme for the park authority with Steve and his colleague Dave McGowan, head of development management, I suggested a series of talks based on topics – sustainability, the concept of design, conservation, use of local materials – 10-15 minutes long presented in a series by three or four LAWSA architects. Dave McGowan was keen: ‘It would be something like a TED (technology, entertainment, design) talk; these are ideas really worth spreading to the public’. Richard Wooldridge of Harrison Pitt Architects explained the design development of a new manufacturing centre for Tritech in Ulverston, Cumbria. Together we worked out a new programme – the where, when, who and how – and it has been an inspiring process; the Lake District planners’ expertise and involvement have made it all possible. Events are held in their large conference room at Murley Moss, Kendal, a space big enough for 70 people to meet together beforehand over tea and cakes, look at our exhibition and then seat themselves in front of a large screen for the talks. The event runs from 4.30-7pm, the last hour of the working day. The planners also have a comprehensive database of local professional and commercial people which has served as a basis from which to send out invitations. Our programme is named ‘Imagine:Inspire:Involve’, and it aims to spark three things. Imagine: how do local architects create a 21st century vernacular that respects the unique Lake District landscape? Inspire: How can we improve the local environment? Involve: How do we promote excellent modern design to local people and to clients? The first ‘Imagine:Inspire:Involve’ was held last November to a packed audience. 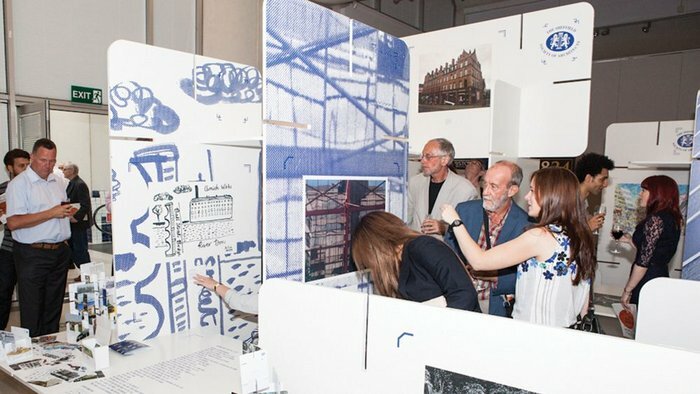 Subtitled ‘Meet the planners; Meet the architects’, more than 60 planners, architects and public bonded – we hope – over tea and cake and looked at the exhibition ‘Building in the Country’. The lights dimmed and people took a seat to hear three LAWSA architects talk about their work, aspirations and how they approached design in the National Park. We were encouraged, in the question and answer session that followed, to hear a member of the park planning committee commend the talks and the ideas behind them. The next event, in mid-March this year, followed the same format but had a more commercial subject; ‘Good design: Good for business’ and a different audience – members of local businesses in the tourist industry, hoteliers, surveyors, together with members of planning committees, architects and planners – again more than 60 people. Three different LAWSA architects talked about the process of design and demonstrated how architects can enhance and bring benefits to a project, this time with an emphasis on commercial and hotel projects. It was followed by questions and lively discussion. I am now talking to another local authority planning department in the area over liaising with LAWSA on a similar project, and we now have a set of presentations about design which can be used again. After the March event a local estate agent emailed me. ‘Thank you for a really interesting evening,’ it read. ‘I had no idea how architects produced their designs. It’s given me a completely new insight into architecture’.